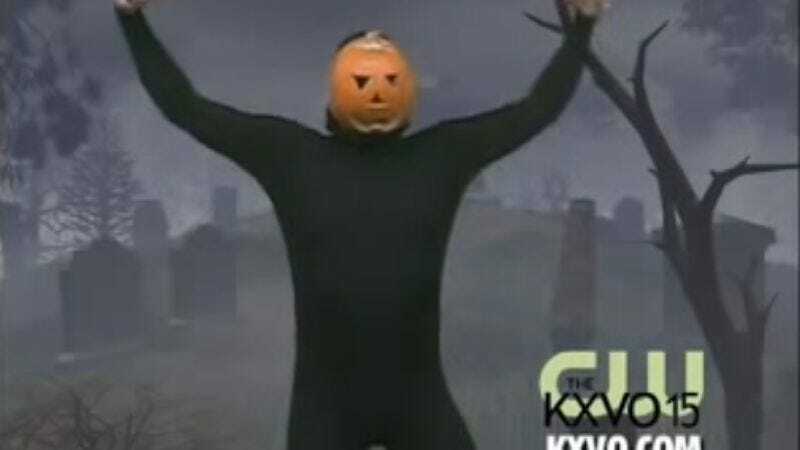 It is one of the Internet’s most gloriously meaningless and yet compelling sequences: a man in a black leotard and a pumpkin mask performs a jolly, repetitive dance to Ray Parker, Jr.’s smash hit “Ghostbusters” in front of a graveyard backdrop. Though originally filmed in 2006, the bit only became a viral phenomenon in 2009. While many may choose to simply enjoy this for what it is, the more intellectually inclined may have questions. Who is this person? Why is he doing this? What forces could have allowed this particular set of circumstances to occur? These restless, inquisitive folks are about to have their curiosity satisfied at last. Studio 360 has released a fascinating behind-the-scenes article about the origins of the mysterious clip, which was recorded for an extremely low-budget, pop culture-oriented pseudo-newscast at KXVO, a CW affiliate in Omaha. Given special attention, naturally, is the man behind the mask, who turns out to be KXVO anchor Matt Geiler. Revealing his secrets to the world at last, Geiler explains why he donned the leotards and pumpkin mask, why the station aired it, and why he refused to reprise the bit on national television. “I will not ruin the sanctity of that character,“ he declares.